The Duncan Academy (TDA) is an Ontario Private high school (BSID: 667206). After students have finished 30 credit courses, the students will receive their Ontario Secondary School Diplomas issued by the Ontario Ministry of Education. 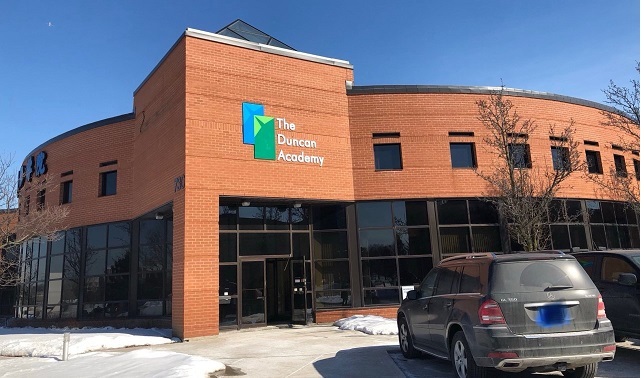 Founded in 2005, The Duncan Academy is a well-known private school for both foreign and local students in Toronto. The school’s atmosphere is so friendly and convenient. The homestay program helps students find living accommodations when they arrive in Canada. Students are able to fast track, by completing their OAC credits in just eight months. We Provide summer school and a one-month intensive course for those students who are pressed for time to start the university in coming September. TDA prepare students who are going to improve their grades to get admission from the recognized Universities in Canada in a short time. 95 per cent of The Duncan Academy’s graduates attend The University of Toronto, York University, Waterloo University and Macmaster University. The courses offered at TDA are inspected by the Ministry. The school offers programs that lead to the Ontario Secondary School Diploma (OSSD). Our program prepares students with skills and knowledge necessary to meet the requirements to enroll in any Canadian post-secondary institution. The OSSD is accepted at Canadian and international universities. All of our teachers are fully qualified to provide quality education. Enrol at The Duncan Academy today. Call or email us for course details and more. At TDA, we understand the importance of offering small classroom sizes. Our certified teachers are able to provide full, undivided attention to the needs of students, focusing on constant and immediate feedback to encourage everyone’s individual development. Furthermore, our courses expose, involve, and encourage students to participate in social, environmental, and intercultural activities to give them a well-rounded learning experience. TDA’s staff and teachers are dedicated to offering students the best education available, emphasizing English language proficiency. We design our education services to equip all students with the knowledge and skills required to lead productive lives in the 21st century. Our goal is to inspire lifelong learners through academic success and overall enjoyment in learning. With our small class sizes, emphasis on English language proficiency, and well-rounded curriculum and culture, Canadian International Academy Canada works to make sure high school students have everything they need to make them successful in the 21st century. We offer English summer camps and after school credit courses to supplement and expand opportunity even further. We’re registered with and accredited by the Ontario Ministry of Education and offer programs leading to the OSSD. Call or email us today to learn how you can enrol. Or contact us using our convenient e-form.